UPDATED: Tue., March 27, 2018, 8:21 p.m. There are a few pressing concerns in Zagland at the moment, beginning with Gonzaga’s conference situation and followed by the men’s basketball team’s personnel picture next season. Neither is crystal-clear. Both could have a whole new look. Both could have an entirely familiar feel. On paper, the Zags could return one of their most promising groups, one that could land in the preseason top 10. 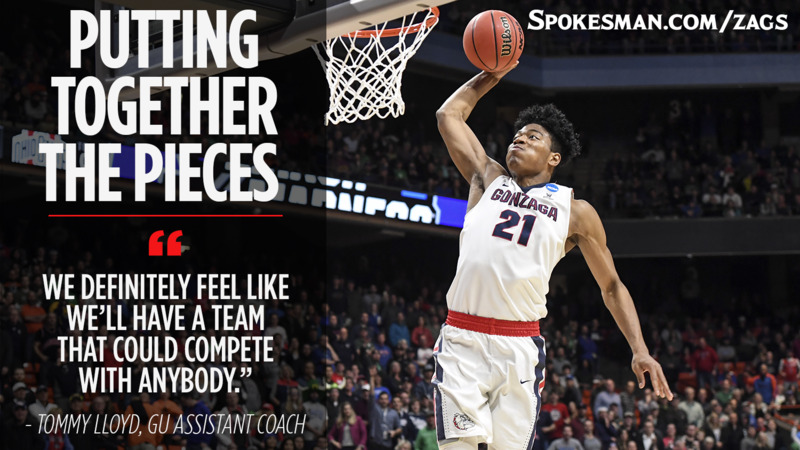 The catch: Sophomore forwards Rui Hachimura and Killian Tillie are showing up on some NBA mock drafts and will have to decide if they want to return or test NBA waters. What’s known is Gonzaga loses two senior starters, honorable mention All-American Johnathan Williams and All-West Coast Conference honorable mention guard Silas Melson. Melson was part of 126 wins, second only in program history to Przemek Karnowski. Williams was MVP of the West Region last season and a two-time All-WCC first-team selection. The Zags fashioned a 32-win season, tied for third in program history, behind a balanced crew. Six players averaged between 13.4 points (Williams) and 9.3 (Melson). Junior point guard Josh Perkins had his best season and was particularly solid over the past two months. He boosted his scoring output, led the team in 3s, hit timely buckets and had an outstanding 2.55 assist-to-turnover ratio. “He’s been a pretty big part of what we’ve done the last few years,” Zags assistant coach Tommy Lloyd said. Zach Norvell Jr., who indicated he plans to return following GU’s Sweet 16 loss, made countless clutch baskets, developed as a playmaker (second on the team in assists) and showed improvement on defense. Hachimura was Gonzaga’s leading scorer in WCC play (12.9) and was often the first option in late-game situations. He had some of his best games against GU’s toughest opponents (Texas, Ohio State, San Diego State, BYU, Saint Mary’s). He used his 6-foot-8, 225-pound frame to finish in transition and overpower some opponents. Hachimura could play the ‘3’ or ‘4’ in the professional ranks, but at either position he’ll have to show improved ball-handling and perimeter shooting. Tillie showed off his shooting range (team-leading 48 percent on 3-point shots) and a quality floater game. He ranked second behind Williams in scoring (12.9), rebounding (5.9) and blocks (37). He shot 58 percent, highest among rotation regulars. Tillie’s versatility and shooting prowess give him stretch ‘4’ ability at the next level, but he needs to improve his strength and low-post game. Freshman Corey Kispert had a strong first month before suffering a sprained ankle that cost him his starting job. He provides size and strength at the wing position with the ability to score inside and outside. Redshirt freshman center Jacob Larsen, returning from a torn ACL, was effective off the bench early, but his playing time decreased over the final two months. Brandon Clarke, a transfer from San Jose State who sat out this season, should make an immediate impact. The springy, 6-8 forward can score, rebound, defend and block shots. He averaged 17.3 points, 8.7 rebounds and 2.5 blocks while earning first-team All-Mountain West Conference honors as a sophomore. Wing Jeremy Jones and guard Jesse Wade saw limited time but could contend for additional minutes next season along with redshirt guard Joel Ayayi and incoming freshmen Filip Petrusev, a 6-11 forward, and Greg Foster Jr., a 6-6 combo guard. Gonzaga has one open scholarship if everybody returns, but that’s often a fluid situation. It’s not hard to envision a starting lineup of Perkins, Norvell, Kispert, Hachimura and Tillie. Or perhaps Perkins, Norvell, Hachimura, Tillie and Clarke. Published: March 27, 2018, 6:42 p.m. Updated: March 27, 2018, 8:21 p.m. Tags: Brandon Clarke, college basketball, Corey Kispert, Gonzaga basketball, Gonzaga Bulldogs, Jacob Larsen, Josh Perkins, Killian Tillie, NBA draft, ncaa, Rui Hachimura, WCC, Zach Norvell Jr.